29 octobre 2012 – Un costume d’halloween assez dingue de la combinaison robotisée « Power Loader » dans le film Aliens où Ripley est ici remplacée par …le vrai bébé du papa bricoleur. 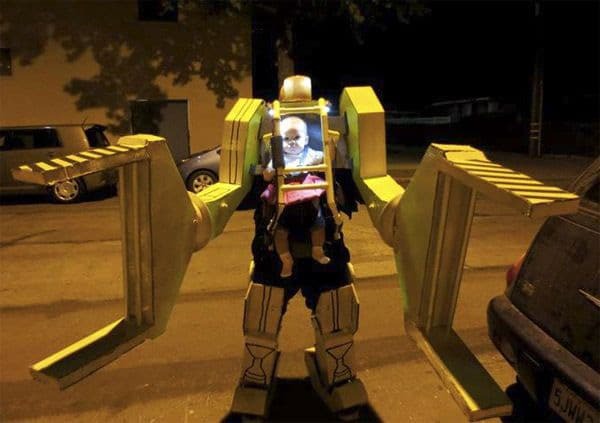 My Daughter and I went to a Halloween Party dressed as the Power Loader from « Aliens. » I love Halloween, and I wanted to create a costume that my daughter and I could share. She was amazingly content the whole night, and enjoyed looking at everybody else’s costumes! I built this robot suit in two nights and a day out of cardboard boxes and hot glue. My baby girl rides comfortably in a Baby Bjorn with the roll cage protecting her. The entire costume only weighs about ten pounds, plus baby. My highest priority was keeping my little girl safe, so the costume was designed for mobility and quick exit in case of emergency. The boots are basically cardboard slippers that could pop right off. With a shrug of my shoulders, I could pop the arms right off. What you can’t see from the video is that there are no bottoms on the robot arms, so my human arms were completely free and unimpeded. I could leave the claws hanging idle from the shoulder joints while I could address any of my girl’s needs. I would have had to take the suit off to changer her diaper, though! The internet has been amazingly kind and positive about this outfit. Thank you for all of the amazing comments and compliments you have posted about my little girl!